Well, it's official. Digital will overtake "traditional" media in share of U.S. ad spending this year. 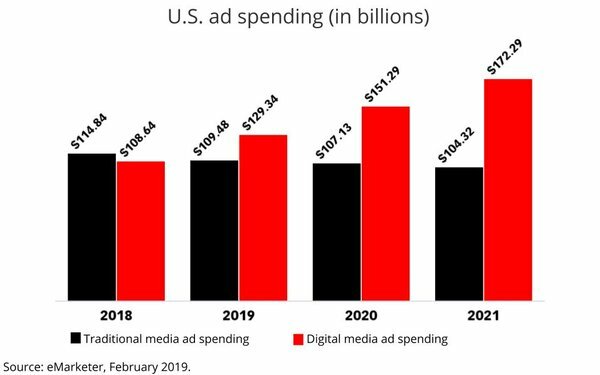 That's the news of the day from digital media statsmaster eMarketer, whose updated calculations call for $129.34 billion in digital ad spending this year, vs. just $109.48 billion for traditional media, which includes things like TV, radio, print, out-of-home and directories. By 2023, eMarketer projects digital's trajectory will exceed two-thirds of U.S. ad budgets, up from a 54.2% share this year. Interestingly, eMarketer projects digital's growth is being driven from a much more diversified base of sources than in recent years, noting that the combined share of the so-called "duopoly" of Google and Facebook will actually decline, despite increases in their overall revenues. eMarketer projects Google’s share will drop to 37.2% from 38.2% in 2018, while Facebook’s share will expand marginally to 22.1% vs. 21.8% last year, thanks largely to growth from its Instagram division. The big winner will be Amazon, which this year emerged as the No. 3 player, displacing Microsoft from digital's top three ranking. Amazon's U.S. ad business is projected to expand 50% this year, and its share of the U.S. digital ad market will grow to 8.8%. eMarketer projects it will reach nearly 10% in 2020. 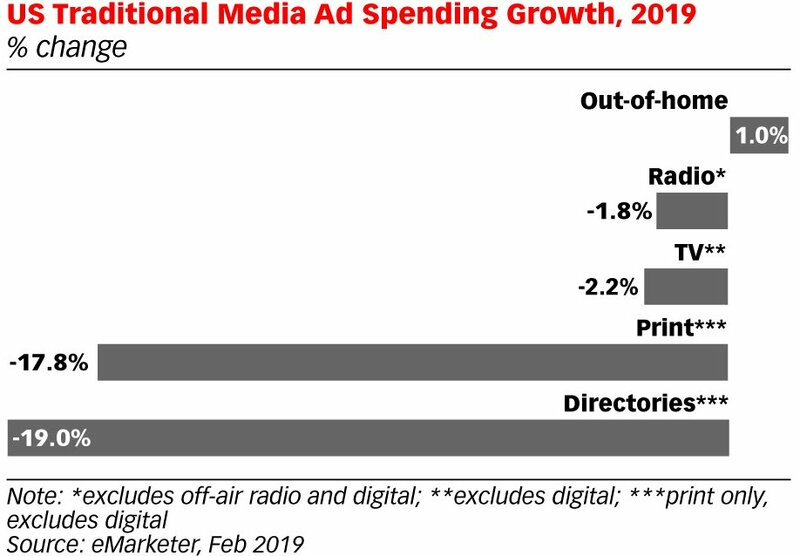 Among the major traditional media, eMarketer projects only out-of-home will expand in 2019.